I've treated myself with a workshop from Suzi Blu for just 55 US dollars. I found her through Rianne who's also a member at SIStv and I completely fell in love with her mixed media art work. The workshop is all about making pretty looking doll girls (see photo above for one of Suzi Blu's art work). She is teaching us all kind of different techniques. There's a lot of stuff to download. I just love her PDF's!!! She's using videos to show how you have to make the girls and so on. For now, I have to draw eyes, faces and gestures in my art journal. I also have to keep a Healing Art Journal. That's probably the first thing I'm going to do tomorrow morning. Last Thursday I have also treated myself with a new winter coat at H&M and some other new and warm clothes. And today I bought new shoes. They were a bit expensive but I loved them sooo much that I couldn't resist. So for the next couple of weeks I have to eat bread and drink water from the tab!! I'm feeling great at the moment!! 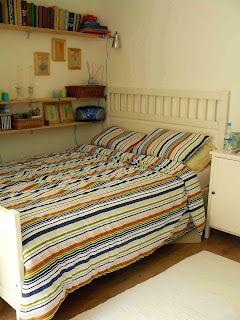 I have a new bed (see photo above) with new matrasses. My old matrasses had spirals in them and according to the therapist I went to see over the last couple of weeks these spirals made me feel very tired because of a spin-off reaction. Normally when we sleep the body is resting and loading itself with new energy. But in my case, because of this spin-off reaction, my system was working all night long and so in the morning I always felt sooo tired. With the new matrasses and the treatment I got, I have more energy and I don't feel so tired anymore!! Even the fibro bothers me less. Normally when it's rainy and cold weather my muscles ache a lot more, but the last couple of days I felt great, in spite of the rainy weather and the cold wind. The pain in my lower back has also reduced. The last time I went to see the therapist he did a treatment to lenghten my right leg which was a little bit shorter than my left leg. So, I'm very excited about this treatment!!!! There's a link to the website of my therapist in an older post. leuk hoor dat je de workshop gaat volgen. Ze maakt prachtige dingen. Bedankt voor altijd weer je positieve reacties betreffende mijn lay-outs op SIS! Soms is het goed om jezelf eens heerlijk te verwennen. Veel plezier met de workshop. Enne heel veel grappige lieve inspiratie daar bij de workshop van Suzi.